They’ve seen me do this over a dozen times. As soon as the hot Angel Food cake pan comes out of the oven, I immediately set it on top of a bottle to cool — whatever bottle is available. So, when my kids pulled the hot chocolate Devil’s food cake out of the oven — which was in a Bundt cake pan — they figured that the circular size meant this cake should be treated as an Angel Food Cake. Except… it was the Devil. The bottle they used just happened to be whatever was available. And this was a full wine bottle full of citronella oil — it was a candle that was suppossed to be on our outisde picnic table. I had brought it inside the day before, because there were heavy winds, and was afraid the winds would knock the wine bottle over, and it would break, and citronella oil would be EVERYWHERE. Except, I forgot to put it back outside. 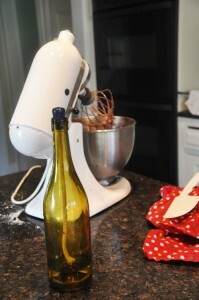 So, when the hot Bundt cake pan rested on top of that citronella wine bottle… I had citronella oil EVERYWHERE….inside. And one beautiful Devil’s Food Birthday cake that was covered in citronella oil. And, I also had very, unhappy frustrated boys…. who were just trying to do the right thing. Without a word, I sent them away, and cleaned up the mess… and let them cool down. They were trying… they wanted this to be NICE… they wanted to succeed. They couldn’t let this end up as a miserable failure. 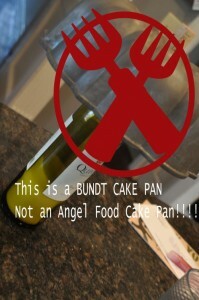 After the oil was cleaned up, the Bundt pan was in the dishwasher… the kitchen only smelling faintly of citronella oil. 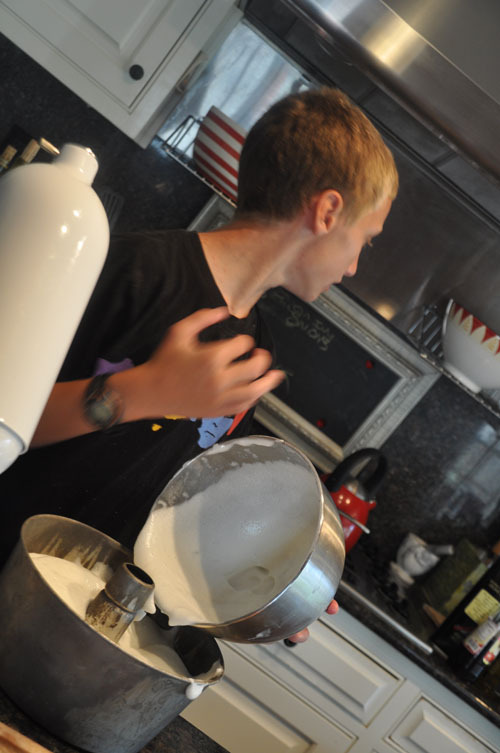 I could have just made the cake myself, and made it easier for them… but I new they could do this… let’s start fresh. Let’s just forget the whole thing ever happened. The result was a perfect angel food cake. 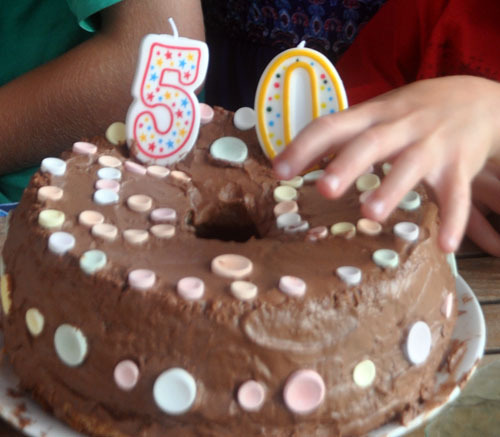 Covered in Devil’s Food Cake chocolate icing… and Smarties. Awwww….they tried! It’s the thought that counts, right? This reminds me of a story that you told me one time about baking a cake for your parents, and the recipe called for “Cream Of Tartar.” Cream of tartar sounds quite a bit like tarter sauce, doesn’t it?